This section provides information about the direction of the club and how you can help by offering your skills and time. 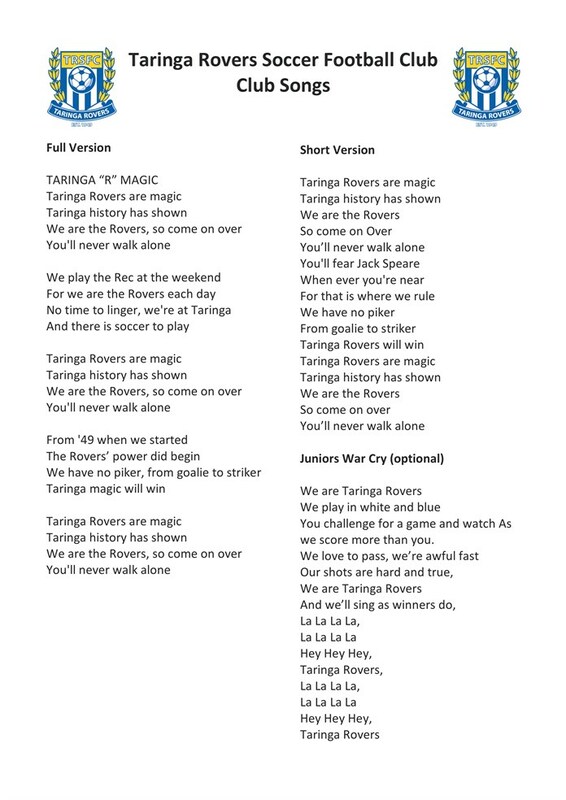 Taringa Rovers is a not for profit community club set up with the object (among others) of ensuring that all persons interested in the game of soccer are given the opportunity to play. As a not for profit community club, all income is used by the club for the benefit of the club. The Committee, who run the club, is comprised of voluntary members of the club (players & parents). In 2016 there were re over 750 registered players from 3year to U16’s in Juniors, Senior Men’s and U18s, Senior Women’s and Over 35’s in around 42 teams. The Committee is responsible for all aspects of operation & management of the club including registrations, fixtures, canteen, uniforms, employment of the Grounds Manager, operation of the clubhouse, liaising with Football Brisbane etc. We all want the best for all players & the club but with the limited time & resources we have, inevitably, there are frustrations & inefficiencies. Take home message - bear with us! There are plenty of jobs to be done, so let us know if you can help out – particularly if you see a gap that you think you have the skills to fill! The more members (& yes, that’s you if you have a player registered with the club) involved, the stronger & better the club will be! Volunteers are always welcome at Taringa Rovers and there is a variety of things to choose from when volunteering. You can donate as much or as little of your time as you want and you may even be able to bring your specific skills to the club to help us grow. Renovations and/or repairs: as with any club with great facilities, keeping them great takes some effort, if you are a qualified tradesperson and would like to help out from time to time, we would love to hear from you. Grant Applications: if you have any experience in Grant applications or you know how to write a good report, then you might be interested in assisting the club in gaining much needed funds for items such as equipment, or new/improved facilities. Event Management/Fundraising: do you have a great fund-raising idea you would like to share? Then why not help out and make that idea a reality, there could be lots of fun to be had. Bar: do you have your RSA? Well then why not volunteer for a shift (or two) up at the bar, we regularly require people for our senior home games and regular events. If any of this sounds like you, or you have an idea of your own, then please contact us at secretary@taringarovers.com.au explaining how you would like to help the club. Taringa Rovers are always looking for new sponsors to assist in the purchase of club playing strips and equipment. We have a number of sponsorship packages available and can tailor a package to suit as well. Please get in touch with us and chat about how we can help you and your business. Taringa Rovers Soccer Football Club Inc.’s Strategic Plan (“Plan”) has been developed to set the vision and direction for the club. It provides an overview of what needs to be done to build on previous planning documents. The new Plan for 2014 – 2018 provides a framework that will guide decision making over the next five years. It will provide focus and will enable the club to be pro-active about the future so as to maximise the opportunities presently available as a result of the strong demand for growth in Taringa, where there is an established centre and public transport to support future growth. The Plan was informed by significant research (literature review, socio-demographic analysis and data review) and prepared after consultation with key stakeholders through meetings, a member survey and workshop. Through this process, the club has identified key objectives that link to Football Queensland’s Strategic Plan and the Football Federation of Australia’s National Club Accreditation Scheme. Due consideration was also given to local planning exercises completed by the Brisbane City Council. A supportive environment, sportsmanship, inclusiveness and transparent communication are the core values that will drive the club forward so as to deliver against the key objectives in our 9 key performance areas.